To some extent, our persistent zonal flow has been the result of a weak upstream blocking pattern. 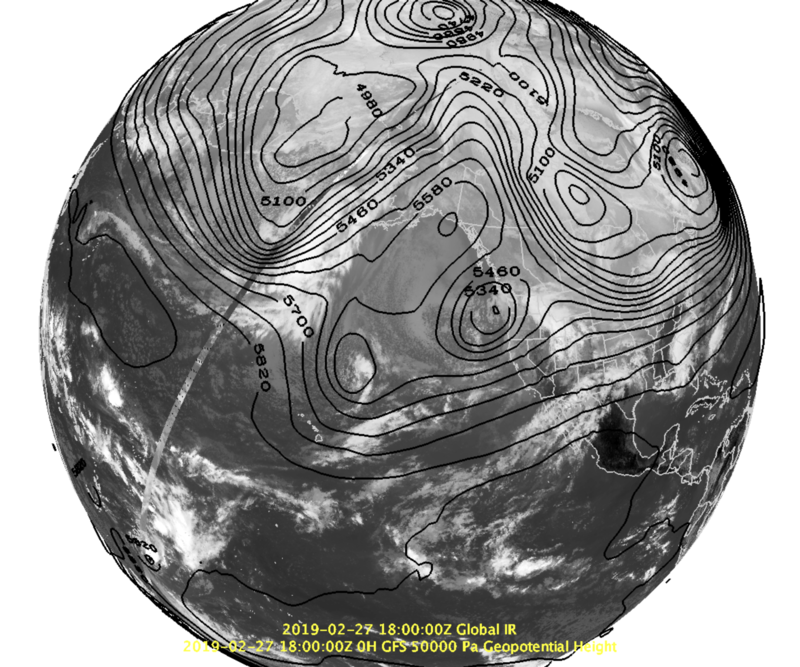 Upper-leveling in the Gulf of Alaska and a broad trough in the eastern Pacific are a typical characteristic of this block. However, the slow-moving low at the Washington/Oregon coast has prevented a full-on blocking pattern and will help initiate a trend of increasingly unsettled weather. By Saturday, the deeper trough over the EPac will move onshore and produce more noteworthy precipitation in the Southwest. 500 mb heights (contoured) and IR satellite imagery highlighting the weak blocking (ridge over trough) in the eastern Pacific and the closed low off the PNW coast on Wednesday. Dynamically, the trough is likely to pass too far to our south to pack a heavy punch. The saving grace is deep moisture and instability will be associated with its passage, and the orographic snowfall machine should still be able to squeeze decent accumulations out of the system. Snow levels appear to flirt with the valley floor initially, highlighting that any late week precip is likely to begin as rain below the benches (all snow up high though). By Saturday morning, however, cold air streams in and light accumulations (1-3”) are possible in the valley. Ensembles are a little scattered on where the snow level will be, but the deterministic NAM suggests around 5000-7000 ft, remaining below resort bases. Weak trough passing to our south Saturday morning as seen in NAM 12 km 500 mb height and vorticity. NAM 12 km Time-Height diagram illustrating a weak trough passage Saturday with flow remaining nearly due westerly throughout mid- and upper-levels during the forecast period. 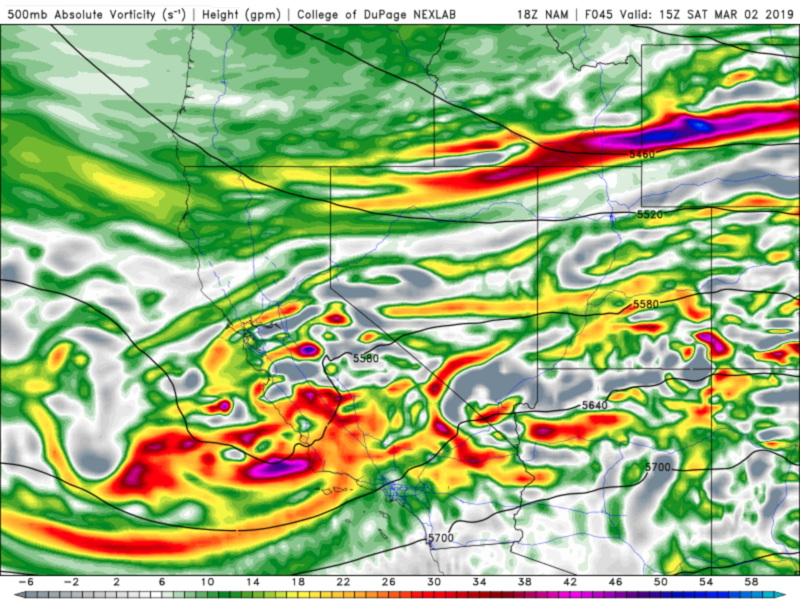 Deep moisture and sustained instability will help keep mountain snow firing. Snow level drops to SL valley floor by Sat AM. In the case of the NAEFS and SREF ensemble QPF, the majority of the spread is in comparing model families rather than within each one. This leans towards a bimodal solution that can make forecasting based on model means difficult. I’ve chosen to lean on the GEFS and ARW solutions here based on prior experience more than anything. We’ll update tomorrow with hopefully increased confidence! SREF Plumes for Alta Collins (CLN) through Sunday night highlighting the bi-modal spread in solutions between the two model families (which is typical here). Leaning towards the drier solution due to the weak dynamics and location of the trough. 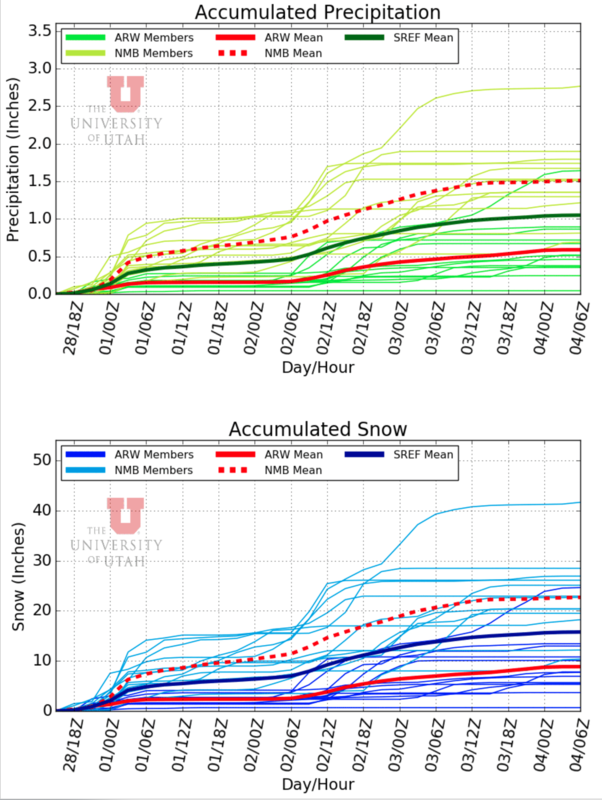 I would cautiously hang my hat on a forecast of 8-16” of snow for the upper Cottonwoods into Sunday morning and 6-14” for the Park City area, noting that accumulations will land on the lower end for low elevation resort bases and the high end of the range for upper elevation terrain. With the trough tracking so far south, accumulations will decrease sharply to the north, with the Ogden area looking at around 2-8” in higher terrain.